The story of mountain gorillas in recent history is one of violence and turmoil, but also hope and fragile recovery. Through poaching, civil war and genocide, large-scale habitat loss, disease, and hunting for the pet trade, the mountain gorilla hung on. Then, with the help of conservationists and enlightened governments, the gorillas did better than that. Where they numbered perhaps 600 at their lowest point in the 1980s, today they are tipping past 1,000. “Kwita Izina” — an annual celebration in which Rwanda’s newest baby gorillas are named — last year named 19 new babies and the year before that, 22. African Wildlife Foundation played no small part in this hopeful story. Our work with gorillas began approximately 50 years ago when we helped fund Dian Fossey’s now-famous study of gorillas in the Virunga mountains. “One of the basic steps in saving a threatened species is to learn more about it,” Fossey wrote in National Geographic, “its diet, its mating and reproductive processes, its range patterns, its social behavior.” Her years of study, before her life ended so brutally, would shed light on all these aspects of mountain gorilla life. AWF was among the first to recognize the need for an integrated approach to mountain gorilla conservation, one that blended anti-poaching measures with community outreach and, most critically, tourism, to make living gorillas a vital, sustainable income source. This vision gave rise to the Mountain Gorilla Project, which helped habituate the gorillas (naturally shy) to humans as a step toward eco-tourism, introduced anti-poaching measures and started local conservation awareness-building and sensitization. In 1991, the Rwanda-based project expanded to include Uganda and the Democratic Republic of the Congo and was renamed the International Gorilla Conservation Programme. Providing training, technical advice, and supplies, the program boosted park authority capacity to protect the forest and gorillas, in part through patrols and monitoring of the gorilla troops. Remarkably, very few gorillas were killed during the worst violence in the region, the Rwandan genocide in 1994. Most recently, AWF has focused on eco-tourism development. By building private-community partnerships that in turn develop community-owned travel lodges, AWF helps create an unbeatable incentive to conserve mountain gorilla populations: income. Since Rwanda’s Sabyinyo Silverback Lodge opened in 2007, for example, it has generated $ 2.9 million for the community, which has resulted in livelihood improvement and strong area support for gorilla conservation. 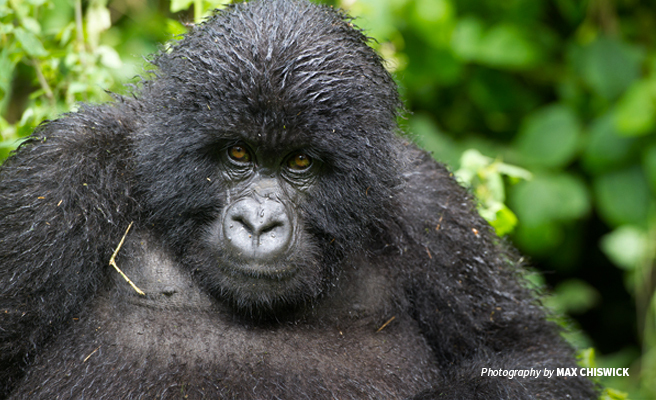 AWF recently secured more badly needed space for the Virunga gorillas, donating 28 hectares to the government of Rwanda, which has shown itself to be an exemplary conservation leader in Africa and is using the land to expand Volcanoes National Park. AWF seeks to conserve populations of all nine subspecies of African great apes and their habitat. In addition to mountain gorillas, these subspecies include the Cross River, Western lowland and Eastern lowland gorillas; the Western, Nigeria-Cameroon, Central and Eastern chimpanzee; and bonobos. Since 2013 AWF has supported anti-poaching and ecological monitoring in Cameroon’s Dja Faunal Reserve, home to lowland gorillas and western chimpanzees. In 2017, we used camera traps and drones to significantly improve tracking of poachers in four hotspots. 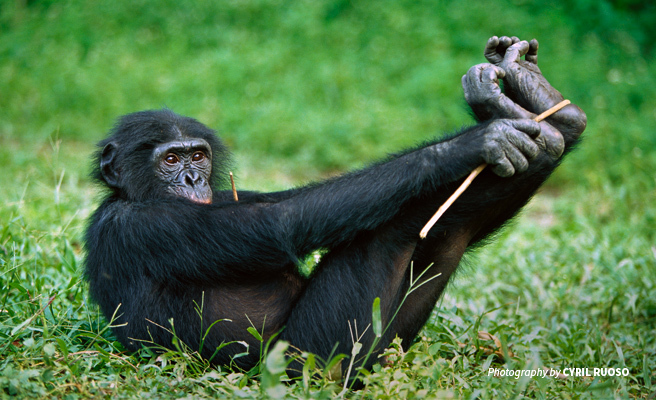 AWF also helped establish two community reserves for critical bonobo populations. The Lomako–Yokokala Faunal Reserve and Iyondji Community Bonobo Reserve lead to jobs and help communities leverage tourism income while increasing our knowledge of the fascinating, critically endangered bonobo. AWF worked with local stakeholders to develop the Iyondji reserve specifically at the request of communities, who saw the economic benefits the Lomako people accrued after the faunal reserve opened there. In the Democratic Republic of the Congo, AWF’s Congo Shipping Project uses a tug-barge called the M.B. Moise to connect extremely remote villages to new markets. In conjunction with agricultural training programs and support for new farmer associations, the project has helped increase incomes by 250 percent. It also has reduced reliance on unsustainable practices such as bushmeat hunting and slash-and-burn agriculture. Jef Dupain is AWF's Vice President, Programs Central and West Africa. He holds degrees in biology and zoology from the University of Antwerp, has served as an associate professor for great ape conservation at Kyoto University, and has nearly 20 years of practical experience working on great ape conservation in and out of the field. Jef has an esteemed reputation as an authority on great ape conservation in Africa and was previously Director of AWF's African Apes Initiative.